You know you're aging when you start rationalizing swim dresses. But hey, it is what it is. Partly due to modesty (especially since I have 2 impressionable little girls), partly due to figure flaws, my bikini days are over. Disclaimer: If I ever work hard enough to get my abs back (or back-ish) and am lucky enough to be on a tropical vacation with my husband sans kids, then I might break out a high waist number. But until then I'm exploring all options. 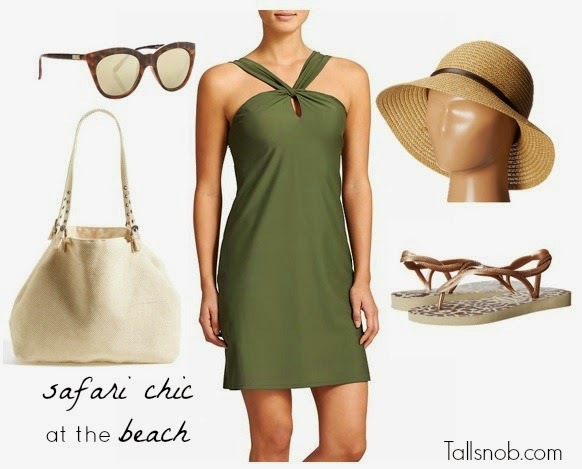 I featured this one over on Tall Snob today and wanted to share the look here. Check it out! (Sources below). Other styles of stylish swim dresses here. Full post over on Tall Snob.